This is MacPredictions . It succeeds Crystal Ball versions 1-3 and Magic Clear Ball 1.0. With all new code and new interface and theme, MacPredictions is a necessary addition to your software library! 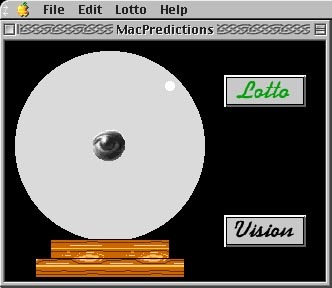 MacPredictions a general purpose fortune telling utility. Just ask it a question and MacPredictions will respond with the answer! Or, enter the Lotto area and answer the requested information and it will tell you your lucky numbers! Works cooler in B&W, too! System 7.0.0 or higher for 68020 or better Macs. 16 colors or more for color.